Though I am a firm believer in the negative review, I can never pretend to like giving one. It gives me absolutely no pleasure to find fault in a novel, nor do I particularly enjoy reading something bad. But when I read a bad book, I often find myself wanting to discuss its failings at lengths. And also, to warn other readers away. If this makes me a bad reader, so be it. 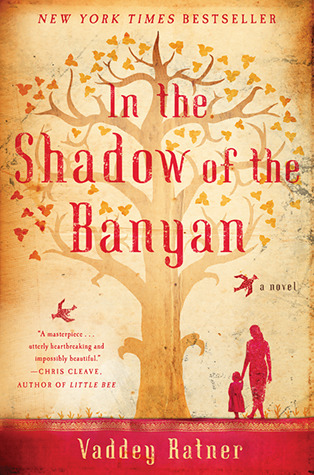 Anyways: In the Shadow of the Banyan is a bad book. I feel I need to be more explicit. It's not just that I didn't like the book. My biggest complaint leveled against In the Shadow of the Banyan (by Vaddey Ratner) is that from a critical standpoint, it just doesn't hold up. Neither writing, nor characterization, nor pacing are deserving of a shred of praise (I can say little about the plot itself seeing as it's mostly autobiographical, and the history of the story is actually quite fascinating). In the Shadow of the Banyan grasps at the most basic, tired cliches and does a bad job with them. So honestly, I can't say that I disliked it because I "didn't connect with the characters", or because I'm not a fan of the genre. No. This is a critical dislike. On the wall near our room's entrance there were several crimson stains - paint or perhaps dried blood - in the shape of hands and fingers stretched to shadowy lengths. Papa caught me staring at the stains, came over with a wet rag, and scrubbed hard until they merged into one big pinkish blob on the wall. Why does Raami consider the possibility of blood? Even assuming a child could jump straight to that idea, why does Ratner explicitly say it? This scene would have been distinctly more powerful to an adult reader had it omitted that explicit reference to blood, showing only Raami's father moving in to wipe away the vague stains, without force-feeding us the notion of blood. What about subtlety? This absolute lack of subtlety, it turns out, repeats itself again and again throughout the book. Ratner describes everything, leaving nothing to the imagination. This can be a useful tool when setting a scene. Not so much when it's endless descriptions of the grass moving in the breeze, or the butterflies, or the smell of jasmine, or about fifty other pointless over-descriptions. Ratner paints a scene to such a level of intricate details that the big picture gets lost, and the possibility of reaching any understanding yourself completely disappears. It's also fairly boring. If it had been only this one case of Raami seeing the world through an adult perspective, I might have been able to forgive Ratner. But this is only one example of many. How about this beautiful sentence? "It was clear to me now that while books could be torn and burned, the stories they held needn't be lost or forgotten." Wonderful, right? But do you know of a single seven year-old who would: a) think this, and b) put it to words? My answer is an emphatic "no". Nor do I know any children (or even many teenagers) who use the words "bovine" or "calamity", or who would say something like "Silently, secretly, I wondered if this moment could be capture somehow, in a crystal vessel of my own, to be invoked again and again should I find myself forever alone." This is the exact opposite of how you write a child character. Let's turn now to the writing. Because technically, this is nice stuff, right? I mean, Ratner's got the words in all the right places and these are such rich words, and such vivid descriptions, and such elegant sentences... Well, no. Ratner's writing style is the type that I especially hate - it's got all the fancy words with none of the impact. This is overwriting, folks. Also: cliched. Early in the book, Raami uses a phrase from her father's poetry to describe her mother: as a butterfly. This motif repeats itself again and again, but it isn't a subtle, gentle idea. Ratner uses her favorite descriptive words like a blunt tool, with little deviation. Even more frustrating, her way to make the reader feel that they are in the "bloody" and "devastating" Cambodia (and not in their comfortable Anglo existence) is through numerous trite descriptions, whether of food, or spirituality, or of Cambodia's landscape. It did not feel natural and true. It just felt repetitive. Then there are the characters other than Raami. Except, there aren't any. With the exception of Raami's naturally biased impression of her parents (one of her only believable childish traits), no other character makes enough of an impact to even factor in. Raami's uncle, various aunts, grandmother... none left any impression whatsoever. Nor do any of the people Raami meets during her various journeys. Characters exist in an entirely one-dimensional existence - they appear, they disappear. But they do not exist. Even Raami's parents: Raami sees their love and devotion to each other. She quotes her father's poetic descriptions of her mother. But we see only idealized, auto-tuned characters. Any potential traits are smoothed out. All I know of Raami's father is that he's a poet. All I know of Raami's mother is that she's beautiful. These are half-characters at best. I should have known to avoid In the Shadow of the Banyan. I should know by now that most authors don't know how to write child narrators, or to describe an unfamiliar locale for an Anglo audience without resorting to basic stereotypical cliches. I should know by now that most books that are described as "beautifully written" are in truth overwritten. I should know all of this by now. But it happened again: I fell for a marketing campaign. I just hope that other discerning, critical-minded readers won't. Ah, it really is good to go with your instincts sometimes - this clearly was not for you! But I can see why you were interested in trying it, sounds like the story behind the story was the best part. This is a well written review but I don't think I completely agree with most of your points. For your first argument, you have to keep in mind that when Raami saw the paint (or blood) on the wall of the school, she had already seen lots of death and blood (think about the chapter when they were escaping Phnom Penh - the doctor with blood on his hands, the old man getting shot in the head) so it would be easy for her to assume that it was blood on the wall. Also, she grew up with a poet for a father. She says in the book that she often saw the world through her father's words, proving that she was fairly advanced for her age when it came to imagination and vocabulary and reading. If you read the book closely enough, you would recognize that butterflies and jasmine aren't just boring, mindless descriptions to fill pages - they are recurring symbols for greater things like peace and beauty. The reason Raami is basically the only character is because the only people who she really ever knew in her life (having been kept inside tall walls of a palace her whole life) have died (or she has been removed from them, as in the case of Pok and Mae). Being that this is semi-autobiograhpical, Ratner couldn't stray too far from the true story and add too many aspects or characters that didn't really exist. You must also keep in mind that this book is written in the past tense, and it is never revealed how old Raami is when narrating this. That said, everyone likes different things and my tastes are obviously just different from yours.